ViewSonic, best known for computer screens and monitors, made its ViewPad 7 official. 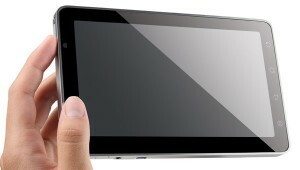 Its European counterpart announced the Viewpad 7 which has a 7-inch screen running Android 2.2 – Froyo! Sure the market is flooded with Android tablets, each competing with the iPad. However the viewpad 7 is more than just a tablet. The ViewPad 7 has both front and rear facing cameras. The rear facing camera is at about 3-megapixel while the vga camera is at the front for video conferencing. The tablet also offers 3G functionality and a slot for the sim card. It was reported that the tablet was similar to the OlivePad which was branded to be India’s first 3G tablet. With all the usual tablet specs the ViewPad might not be an iPad killer. There is not word yet on availability. The viewpad 7 is said to be priced to sell for about$543 and to be launched in the UK. Previous Faster Mobile Phones – LG E900 Running at 1.3GHz!